It is almost a certainty that come Feb. 4, Jacob Oliva will be named Flagler County’s new school superintendent, and that he possibly will assume the post sooner than the end of June, when Superintendent Janet Valentine was scheduled to retire. The determinism behind the appointment has rankled some members of the black community, who point to an inexcusably high rate of failing minority students, and who say that nothing short of a regime change—new blood at the top—can break away from the status quo. The school board’s full confidence in the current regime begs to differ. Valentine appointed Oliva in June 2012 as her deputy and superintendent-in-waiting, a decision the board applauded. A majority of Flagler County School Board members are already on record strongly favoring Oliva as her replacement. And Oliva’s seamless assumption of Valentine’s responsibilities since Valentine suffered a stroke before Thanksgiving appears to vindicate her decision not only to create a succession plan, but to have Oliva be that successor: despite Valentine’s absence, the board, which prizes collegiality and cohesion, has powered on—aggrieved over Valentine’s absence, but essentially unaffected by it as an organization. The school board conducting a search mostly—but not entirely—for the sake of appearances, principally to appease the NAACP, but also to more publicly vet Oliva’s candidacy and avoid the charge of making a unilateral choice without public input. Think of it as a the confirmation hearing of a well-qualified candidate for a judicial seat: while the majority of the Senate may be prepared to vote for the nominee, the hearings, on rare occasions, can reveal a fatal flaw and change the course of the nomination. 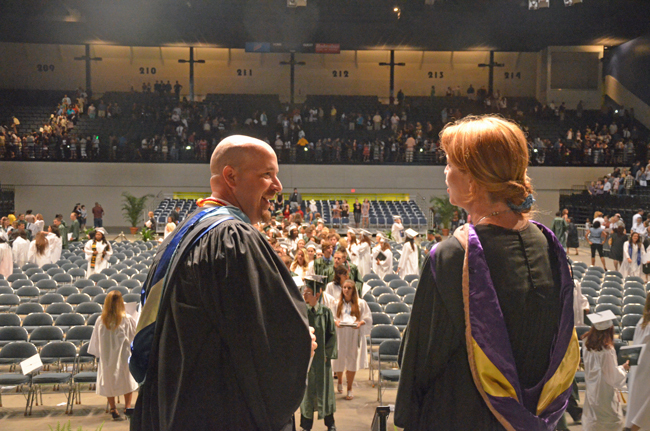 Since Oliva has been in the public eye for the past four years—as a principal at Flagler Palm Coast High School and an assistant superintendent—a surprise derailment is unlikely. He is the Chosen One. But hearings must still be held. But she still has no illusions. Dance sees Oliva’s performance since Valentine was hospitalized as grist for more confidence in him. “Having Jacob in place has definitely been an advantage for the district and allowed us to continue with business as usual without any hiccup,” Dance said. On Tuesday the board appointed its 15-member search committee, with each board members choosing three committee members. (See the list below.) The board outlined the process from now until the announcement on Feb 4, starting with committee meetings on Dec. 10 and 12 to produce a job description. The job will be advertised for a month, from Dec. 16 to Jan. 17, which happens to include the slowest business weeks of the year. The committee will meet again on Jan. 17 and 22 to draw up a short list of applicants, three of whom will be interviewed on Jan. 30 and 31 by the school board. All sessions of the committee and the school board will be open to the public, and open to some public participation, but the committee will be limited to making recommendations only. The final decision is the board’s, and it will be announced at a 1:30 p.m. meeting on Tuesday, Feb. 4. One of the voices the committee and the board will keep hearing is that of Rev. Sims Jones, a pastor who makes no secret of his strong disagreement with the board’s approach. He is not happy that none of the board members picked him to participate in the search committee, though he made his desire to serve known. He considers the committee a hand-picked group of people who’ll fulfill the board’s pre-determined wishes, which are not his. He wants a black superintendent. Jones isn’t imagining things: Blacks make up 13 percent of the school district’s population (almost in line with the national proportion of blacks in the population), but are almost invisible among teacher and administrative ranks. The disproportionate number of black students getting disciplined and expelled prompted a lawsuit by the Southern Poverty Law Center that itself shook the district into more purposeful action, especially with teacher recruiting, but broad-based results haven’t yet become apparent. “I have been looking for new ideas,” Jones said. “the best way to improve the scores and the academics of the children, someone with some kind of idea as to how we can get our children from being 40 percent failing—there’s something wrong at the top, that’s not the teachers or the principals, that’s something wrong at the top. Sixty percent of minorities are failing, and that to me is unacceptable. That’s what we need to change, because continuing to do the same thing will continue to get the same result.” He adds: “Not being disrespectful or anything, but a white person cannot understand what’s going on in the culture and the way things are done in the black culture.” Jones concedes that that’s not just a white problem, but a mutual one, created by mutual alienations that neither side is learning to bridge. The pressure on the school board to conduct a more open process is also geared at more than the superintendent’s choice, Haywood said: it reminds the board that minority issues have not been given their due, that they are a priority, and that beyond the likely appointment of Oliva as superintendent, the hard work will yet have to be done. In sum, while Oliva’s place may be assured, the assistant superintendent he appoints may be scrutinized by minority stakeholders as much as his own appointment will be. And between now and the appointment, many ears will be trained on how Oliva speaks of the achievement gap and its rarely spoken-of racial parameters. Whatever he says—or doesn’t say—may define the degree of trust his most skeptical constituency is willing to invest in him once his tenure begins. Maria Pinto-Barbosa; Bill McGuire; John Winston; Mitzi Gee; Nancy Walsh; Sandra Stubbs; Barbara Revels; Peter Birtolo; Myra Middleton; David Alfin; Joe Rizzo; Jessie Magee; Carol King; Sal Passalaqua; Lauri Alter. See the school board and the search committee’s schedule here. Superintendent Janet Valentine is very ill. She is totally incapacitated, hospitallized and will never be able to return to her duties. Of course the Board had to move Jacob Oliva appointment up to February. Prayers to Mrs. Valentine for a full recovery and a happy healthy retirement. How pathetic some would politicize the misfortune that has befallen Mrs. Valentine. Dr. Myra Middleton, she was the worst thing that ever happened to the ESE department in Flagler, she caused more havoc and lawsuits then anything positive. This is nothing more than a dog and pony show by the FCSB, pure and simple Oliva has the job, why jerk other people around? So you can satisfy the NAACP? If we demanded a white superintendent we would all be racist, let the most qualified person have the job. The only problem I have with Oliva getting the job is that he is from the same mold of administration we have now, and the district is not where it should be. Will we see any positive change by someone who is already following the same old plan; I still feel we need an entire new school board to really see a positive change in Flagler County. Perhaps the recent “business as usual” is more a reflection of Janet Valentine’s shortcomings than of Jacob Oliva’s readineess? Check your fact FL, the Jaguars have not been eliminated from the playoffs yet. Why in the world would you hire based on COLOR and NOT ACHIEVEMENT? It is not because of a White Superintendent. That is just a racist view and trying to pin the blame on everyone else but those who deserve the blame. The PARENTS! or lack of. Nobody else is responsible for your kids. Yes FL is correct. This is a done deal and school board members have said as much that Mr. Olivia is their man. No if ands or buts about it. This is a charade to placate the voters. The deed was done when the assistant’s position was created. The school board is paying five thousand dollars for a search so it has essentially bought itself the spector of being above board with this search when it is anything but above board. Pastor Jones accuses the school district of being racist by not hiring a black individual yet he (and others) fails to see that he is the one being racist in wanting the school district to specifically hire a black person. The district was wise not to have him on the committee. Mr Oliva is a minority, a Hispanic that the US insidiously classifies as a race. There is no racism on the district’s part. No sure where this come from in our County, alot of finger pointing of race and discrimination? Just because your black doesnt give you the right to say I am being discriminated on and I going to sue, and get money and my job back? and just because your not black can you say that we are not being unfair, towards people who are black, white, But we have to keep the number of equality up, its all about the color and number huh?